Sink your feet into something plush by choosing carpet from our flooring company. We offer carpets in a wide range of styles, colors, and materials. Simply choose the style that satisfies in appearance, performance, and price, and we’ll handle the rest! From removing old flooring and prepping the underlying surface to completing the finishing touches of a successful installation, we do everything so you don’t have to. Other carpet stores may pull the carpet out from under you once you walk in the door. Not us. We specialize in personalized services, no-pressure sales, and upfront pricing on all of our carpeting. Best of all, we are more customer oriented than many of the other big-chain businesses around. With the exceptional services and selections we offer for flooring replacements, you can confidently begin a home improvement project like this. To ensure you remain more than satisfied shopping at our store, we back our placements and our prices with special guarantees. If after 30 days of your purchase, you find a lower price on the same carpet brand and style, we will refund the difference. We do this because we are proud of what we have to offer, but most importantly, we care about our customers. Allow one of our knowledgeable in-store associates to make floor shopping easy and enjoyable. Selecting the perfect carpet for a single room or the entire home no longer has to be a tedious or time-consuming experience. We are prepared to show you around the many types of carpeting currently on display at our location. Berber Carpet – As one of the most coveted types of carpet available, Berber carpet embodies the perfect balance between beauty and durability. Designed in different hues and fibers, Berber is a dependable choice for areas that experience high levels of foot traffic. Typically featuring lighter loops of material with flecks of darker colors, you can count on this carpet to also deliver the appealing aesthetic you desire. Frieze Carpet – Frieze carpet is another fashionable carpet favorite. Featuring twisted tufts of carpet fibers, it reduces the noticeability of unwanted footprints and vacuum marks. Available in a variety of hues and even attractive patterns, frieze is a sophisticated option for your household. 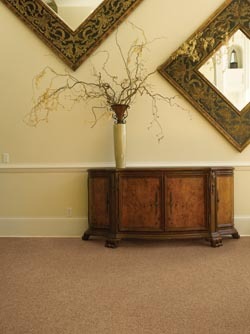 Plush Carpet – Plush carpeting is the epitome of smooth elegance. Manufactured in almost any color imaginable, it supplies the perfect amount of pizazz your home interior needs. Nylon plush carpet is particularly wear resistant and cleans easily with regular care. Textured Plush Carpet – Similar to traditional plush, textured plush also comes in a variety of attractive hues. However, this plush product features fibers in multiple colors and heights. Many of our clients claim that textured plush carpet is ideal for rooms where children frequent. Make a truly wise flooring investment by using our five-star selection system. Each of the carpet products we carry is ranked using ratings from customers just like you. The easy-to-understand system allows you to narrow down the many options available to those most likely to satisfy based on your budget, and any particular characteristics you desire. When you hire our team of skilled installers for carpet installation, you can depend on us for reliable work and beautiful results. Allow us to put something appealing under your feet by entrusting the product placement into the hands of our trained technicians. This in-house team is very detailed oriented and proud of the services they perform. In fact, they actively strive to guarantee complete satisfaction. Every installation we complete is backed by our industry-leading Ultimate Confidence Guarantee. The guarantee is a unique promise that if you are unsatisfied with your new carpeting, we have you covered. As long as you get back to us within 30 days of the initial installation, we’ll replace it with a comparable product, free of charge. Ready to replace old and outdated flooring? Contact us today to learn more about the carpet available at our store. We proudly serve the communities of Johnstown, Somerset, Latrobe, Derry, Greensburg, Pennsylvania, as well as the surrounding areas.